This has become my go to recipe for pork ribs. 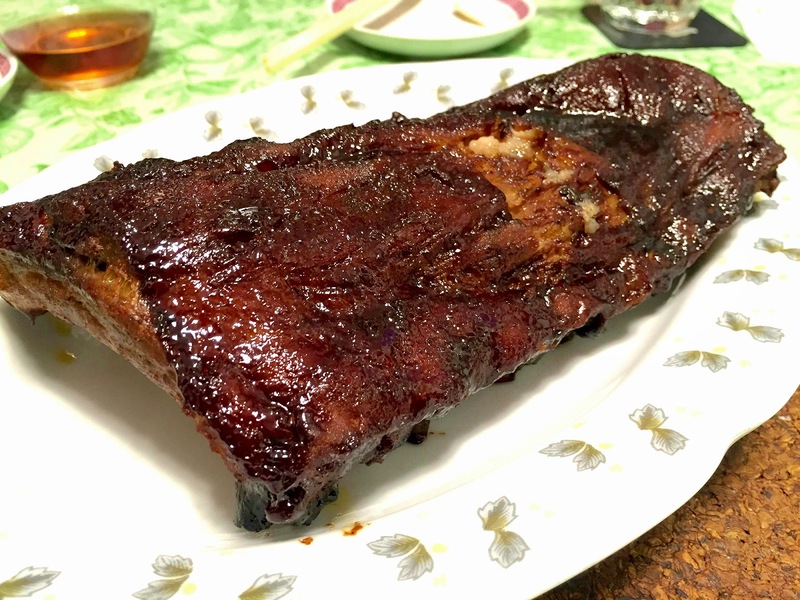 The ribs are tender, moist and flavorful. It is 100 times better than the ones from Outback! I made this together with Issac and we were both surprised how great it turned out! Lick our fingers! The original recipe calls for hickory smoke salt for the smoky flavor. As it is quite impossible to find it in Hong Kong, I have substituted with a mix of BBQ sauce (50:50 original to smoky BBQ sauce). The smoky flavor did turn out great! Peel off tough membrane and extra fat that covers the bony side of the ribs. Mix together the sugar and spices to make the rub. Apply rub to ribs on all sides generously. Wrap the ribs in aluminium foil. Roll tight the edges of the foil. Place on baking sheet and bake for 2 hours (ribs in the foil packet) or until meat is starting to shrink away from the ends of the bone. Remove the ribs from oven. Turned up the oven to 350 F. Brush the BBQ sauce to the meaty side of the ribs. Bake for another 30-45 minutes (open up the foil) until sauce is cooked.